Cassidy http://declancassidy.com Irish writer and film maker, best known for the Oscar-qualifying Irish Film Board funded short 'Whatever Turns You On'. Just published his debut novel "Pins and Needles" and working on the sequel "Sticks and Stones". Yesterday was a poignant milestone in my Mum’s Alzheimers journey. My latest (second ever) vlog post to YouTube talks about it. Three years after my Dad’s death she asked me: “Where’s Jim?”, and, trying to hold it together, I had to tell her, for the second time, that he had passed on. 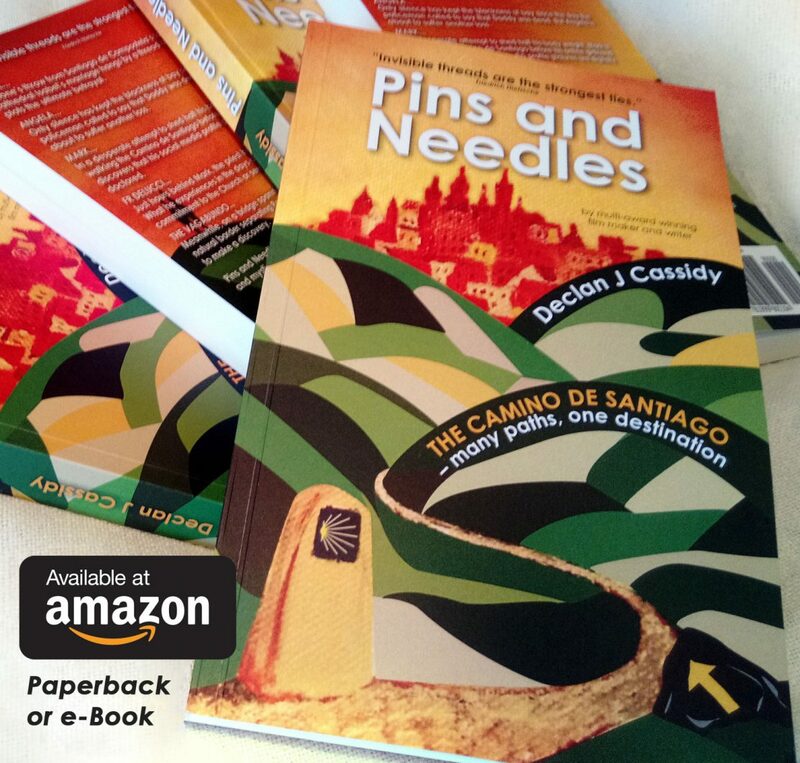 Having walked the last stage of the Camino de Santiago along the lesser known and, therefore, less commercial Portuguese route to research my book Pins and Needles, I became somewhat of an accidental expert. In order that this knowledge shouldn’t go to waste I put together a 26 page booklet in pdf form giving some tips and information for anyone who’s considering putting a backpack on their back and setting off for a week on the ancient pilgrim trail. As you’ll see from the guide, I thoroughly recommend it for all sort so reasons. You can download the free pdf here. Buen camino! Because I’m in Rome, I’ve been sitting in a little delight-of-a-trattoria, sampling a pear and walnut salad with Gorgonzola. Because I’m in Rome I’ve been sitting near the open window to escape the heat. When I left Dublin this morning it was wintry and I feel that getting acclimatised will take a while. I’ve been observing the quandary of a woman and her car, which had been parked front-to-footpath in the appropriate fashion outside. Because this is Rome, she returned to find herself practically trapped into the parking space by a large people-carrier vehicle, parked in manner that is illegal, even in Rome. Because she is clearly from Rome, she didn’t make a fuss but, instead, took a deep breath and began to attempt the Houdini-like escape feat of extracting her vehicle from between a motorcycle, a car and the thoughtlessly parked black monster. In a true spirit of Roman humanity, a man appeared on the scene from nowhere and began to wave, shout, coax, gesticulate and cajole the woman and her car through the intricate set of manoeuvres that he felt would set them both free. Being Rome, a small crowd of assistants, supervisors and onlookers soon joined in. He who had been first to step up to the task was not to be unseated from his heroic status, however. He persisted until, between his somewhat ambiguous directions and the driver’s growing nervousness at the scene she was causing, he had contrived to leave her wedged tightly between all three vehicles. To me the situation seemed hopeless. But, this being Rome, the woman’s savior was not to be outdone. “I’ll move it,” he announced, and, taking the keys of the offending black people carrier monster out of his pocket, he did so, putting the twenty minute struggle to an abrupt and satisfactory end. This being Rome, nobody seemed perplexed.